Types of Arthritis Guttate psoriasis is a particular form of psoriasis, although its occurrence is found to be very rare. 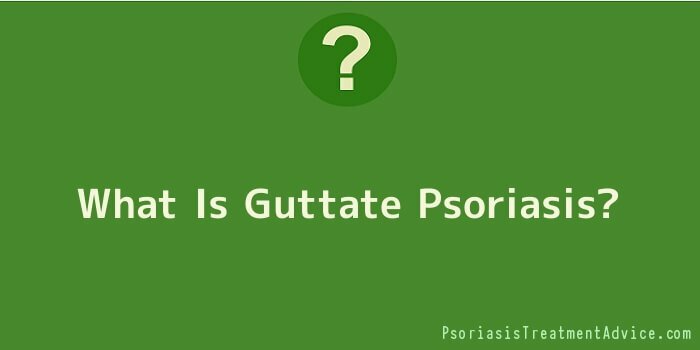 Not more than 2 percent people who develop psoriasis are infected with the guttate form. Psoriasis is an inflammatory response of the skin. Children and younger adults below the age of 30 are known to be the ones more vulnerable to developing guttate psoriasis. The primary cause of this uncommon skin condition is a streptococcal infection. The development of lesions on the skin usually happens 2-3 weeks after a person gets infected by the streptococcal bacteria. The bacterial infection affects the throat first after which the skin inflammation starts. This episode of psoriasis can be the first outbreak in many and it can also be the last. But in a few, there is a chance that the episodes can become chronic. In such people, it is not just the streptococcal bacteria, but also other conditions like chicken pox or cold can also lead to the lesions on skin. People, who consume excess alcohol, suffer from stress, rheumatoid arthritis and various skin injuries are also known to develop this condition. The most evident symptom of this condition is the appearance of drop like lesions on the skin of the affected person. It is this drop like lesions that differentiate this form from the other common forms of psoriasis. The arms, legs and the trunk are the ones that are first affected, slowly after which the pinkish drops start appearing on the scalp, ears and the face. Itching of the lesions is also very common. The lesions are covered with skin like flakes called scales. It is important that the condition is immediately referred to a doctor who could suggest some antibiotics if the guttate psoriasis is being caused by the streptococcal bacteria. If the disease is only mild, it can be treated at home itself by using cortisone creams, moisturizers, over the counter dandruff shampoos and by taking prescribed Vitamin A or D containing medicines. For those suffering from the severe form of the condition, the body’s immune system has to be suppressed with the help of drugs like methotrexate, corticosteroids etc.